Postcards From Liverpool explores the Beatles’ source sounds. 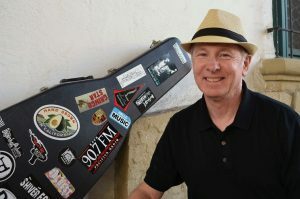 Music journalist Mark Brickley deconstructs the group’s vocal style, traces Motown’s and Bob Dylan’s influences and follows the Beatles into EMI/Abbey Road studios, explaining their recording techniques and innovations. The book’s forty photographs include Paul McCartney, Ringo Starr, Pattie Boyd, Ravi Shankar and Beatles’ sites in the USA, London and Liverpool including the Cavern Club. There are six rare backstage interviews, a panorama of the Beatles 1968 trip to Rishikesh, India and side trips to Ringo Starr’s Grammy Museum press conference and Paul McCartney’s Hollywood Walk of Fame Ceremony. What Beatles decision in 1962 changed pop music forever? How did Lennon & McCartney sing harmony in parallel thirds? What happened to the ring that Ringo wore during every concert? How many of the Beatles’ sons became recording artists? What career paths have the Beatles’ daughters taken? All Qs answered in book. 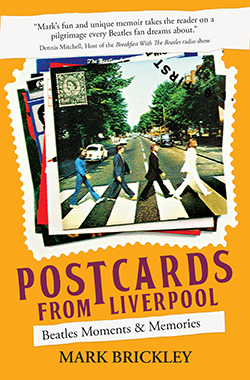 Get your copy of Postcards From Liverpool: Beatles Moments & Memories today!